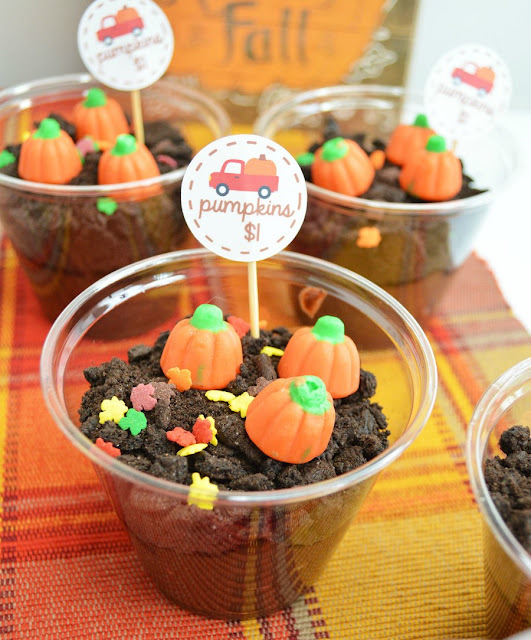 These fun little dirt pudding cups are dressed up and ready for a trip to the pumpkin patch. The free pumpkin truck printable means you can have your own cute treats in no time! 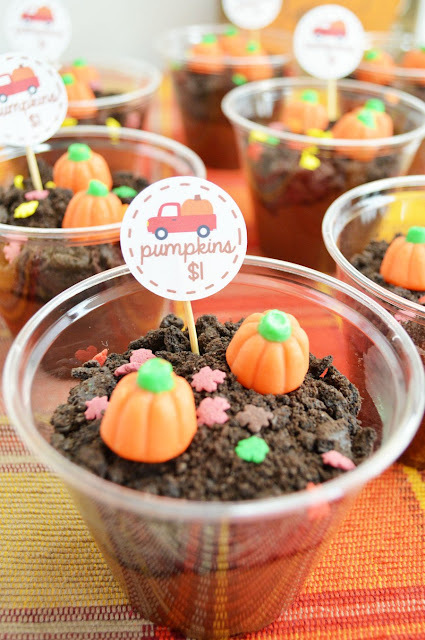 Fun and easy chocolate dirt pudding cups are dressed up for a trip to the pumpkin patch. There's even a free printable to up their cute factor. Make these fun treats for a pumpkin carving party, Halloween or a fun classroom treat. Hasn't fall been fun so far? I love everything about this time of year. Mother Nature was even nice and started lowering the temperatures right on cue. I got to break out a beloved hoodie for a few minutes early one morning! Hooray! It has been a celebration of all things fall here on the blog as well. First I shared some of my favorite fall dinner ideas. Then it turned into a fall food extravaganza with two of my favorite theme weeks. I really enjoy trying new pumpkin recipes each year for pumpkinweek. This year the pumpkin pepper jack macaroni and cheese got people talking. The no bake pumpkin cheesecake was a show stopper with its layers of goodness The cheesecake rosettes really made it stand out. Simple chocolate pumpkin cupcakes only take a few minutes to throw together. The pumpkin keeps them so soft and there's just a hint of spice too. Then there was appleweek. I love hosting appleweek each year and this was by far the biggest. We had great prizes and almost 200 apple recipes! I shared two savory recipes this year, a skillet chicken and apple meal and a fun apple, prosciutto and ricotta tart. Of course there were sweets too! You should put the German apple cake, caramel apple charlotte cake and applesauce oatmeal bread on your fall baking bucket lists! But after a week of celebrating pumpkin recipes and then eight straight days of apple goodies, it is time to switch it up a bit though. Chocolate is always a good decision. Always. So I thought I'd share a simple and fun treat with you today. These cups take hardly any work to put together. If you have kiddos, they would have a blast helping you do it. Just layer the pudding in cups and top it with chocolate cookie crumbs. That makes it look like dirt. A few little sprinkles and a pumpkin candy later and it looks like you've got a mini pumpkin patch. If you're picking a whole patch worth of pumpkins, you'll need a truck. Luckily we've got cute trucks in spades on these free printable cutouts. Just click on over and print out as many as you need. Cut them out and tape them to toothpicks to adorn the cutest little dirt pudding cups you've ever seen. These would be so much fun as a pumpkin carving treat. Maybe you want to do a family friendly Halloween treat that won't creep out the littles? This is perfect! Is one of the kiddos having a classroom party? They are easy enough you could make them for the whole class. Don't have a great excuse? Make one up! Whatever you do, just make some of these cute pumpkin patch treats! Make pudding and place in refrigerator to chill. 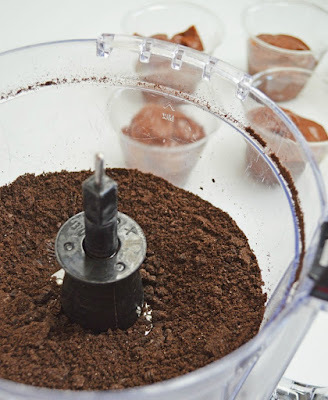 Put chocolate sandwich cookies in food processor and pulse until you have crumbs. Spoon cooled pudding into plastic cups and top with cookie crumbs. Decorate with sprinkles and pumpkins. Cut printed circles out and tape to toothpicks. Super cute Carlee! My little ones would love these! Thank you! It doesn't get much easier either! I love this recipe! It's so fun and great for kids. And, there's a printable! The printable is darling. 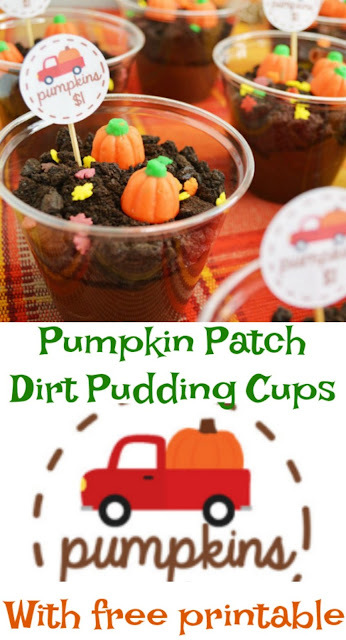 It makes such a cute addition to the dirt pudding cups, which are also so much fun. These are such a super fun and cute snack idea! My kids would enjoy them a lot! And they are so easy, which makes them even better! 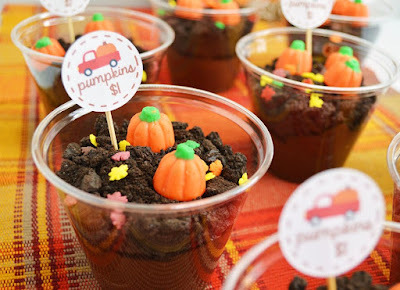 Carlee, these Pumpkin Patch Pudding Cups are adorable! I made them a feature at this week's Whimsical Wednesdays Link Party. Thank you so much for linking up and sharing with us!